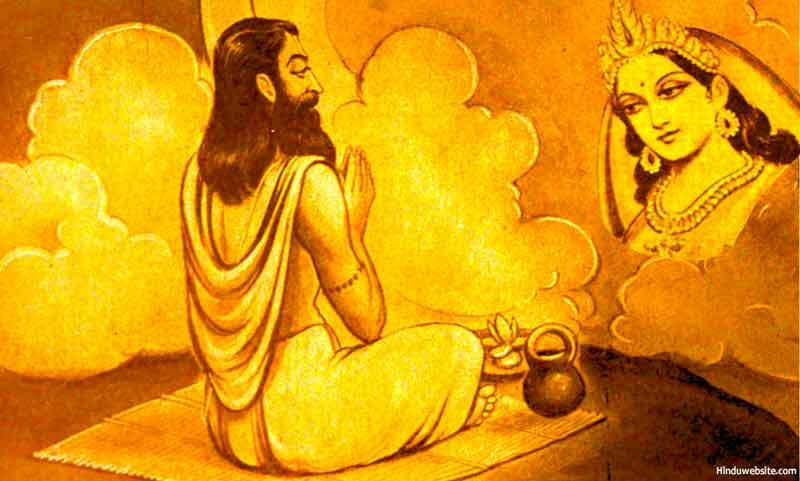 Nrisimha Tapaniya Upanishad is presented usually as two separate Upanishads, the Nrisimha Poorva and the Nrisimha Uttara Tapaniya Upanishads. In this section we have presented both the Upanishads together for reader's convenience. The Nrisimha Tapaniya Upanishad speaks about the incarnation of Lord Vishnu as Narasimha, who incarnated partly as human and partly as lion to rescue Prahlada from his demonic father and save the worlds from the latter's oppression. 1 He is called “Ugra [fierce]” because by his power He creates, looks after, destroys and elevates without break and also attracts all devas, all beings, all bhoothas Hey Lord Narasimha, you who is being praised by me, please give me perennial happiness even when I am in this body which is not permanent. Let your soldiers kill all my enemies who are different from me. 2 He is called “Veera [heroic]” because by his power He makes all worlds, all devas, all beings and all boothas play, and allow them to take rest and also creates, helps them grow and attracts without any break these worlds, devas, beings and boothas. He is behind every action, very capable, mountain like and one who fulfills the desires of devas. 3 He is “Maha Vishnu”, because he pervades in all the worlds and makes all the world pervade, similar to the fatty gum that spreads in all meat, from this side to that and also from other side to this side. There is nothing in the world that is not him. He is pervading in all things in the world. He is the leader of all souls. Worship of souls is His worship. He exists in all the three shining things viz. Moon, Sun and fire. 4 He is called “Jwalantham [burning]”, because he makes the entire world which includes all devas, all beings and all Bhoothas shine because of his luster and also shines in them and makes them release flames. He is the one who created the world and makes it rapidly multiply. He is the one who shines because of his own luster and also makes others shine. He spreads heat throughout the world and makes the world swelter. He spreads his rays everywhere and makes them release rays. He has a personality which causes only good. He gives only that which is good and he is good. 5 He is called “Sarvatho Mukham [having faces everywhere]” because he sees everywhere without having any organs, he is able to hear every thing, he is able to go every where, he is able to attract everything, and also because he is spread everywhere and exists every where. In the beginning he was alone and he has become all these things now. Those who rule over the world came from him. In the end everything goes back and merges in him. I salute him who has faces every where. 6 Among all animals the most fear some and also most special is the lion. That is why God of the Universe took birth as Narasimha. That deathless form became one which does good to the entire world. That is why he is called “Narasimham [half man and half lion]”. That Maha Vishnu who has this fearsome form does not cause fear among his devotees. He is being worshipped and praised by them. He is the one who travels all over earth and also one who lives on the mountain top. In his form of Trivikrama, he measured all the worlds in three steps. 7 He is called "Bheeshanam [fear full]” because all the crowds of devas, men and Bhoothas and all the worlds run away fearing Him; but he is not afraid of anything. The wind blows because it is afraid of Him. The Sun rises above because he is afraid of Him. It is because of fear for Him, that the God of fire, Indra and the God of death do their work. 8 He is called “Bhadram [safe]’ because he is good things personified, because he forever shines giving good things, because he makes others shine, because he is superior and because he does very good things. Hey Devas, we have to hear with our ears about this “Bhadram”. Hey, those of you who are fit to be worshipped, we have to see with our eyes that “Bhadram”. Let us live as much as the Gods live with healthy organs and healthy bodies praising and singing Him. 9 He is called “Mruthyu-Mruthyum [death and deathlessness]” because just by mere thought of His devotees, he destroys death and untimely death to them. He is one who gives the knowledge of the soul and also one who gives strength. All devas bow before Him and praise Him. Let us satisfy Him by offering Him “Havis-food” through the fire sacrifice because even his shadow is nectar and he is the death which destroys death. 10 He is worshipped by the chanting of “Namami [I salute him]”, because he is being worshipped by all devas, all those who have forsaken his world and all those who swear by Brahmam and also because the lord of the Vedas worship him telling these words. Indra, Mithra (Sun), Aryama and all other devas exist in him. 11 I was born before this world which is pretty and orderly. I existed even before the devas. I am the central power of that which never dies. He who gives me (in my form as food for people) in charity, becomes the one who protects the soul. If given without understanding this, I who am food, eat the one who eats. I am the one who becomes all the world and destroys it. My light is like that of a sun, who standing alone gives light to all the world. This Upanishad says that one who understands this attains salvation. 3. The Yajur Mahalakshmi Mantra is “Aum Bhoor Lakshmi, Bhuvar Lakshmi, Suva Kala Karni, Thanno Lakshmi Prachodayath”. This has 24 letters. All this universe is in the form of this Gayathri. So the one who knows this Yajur Maha Lakshmi Mantra, would enjoy great wealth with lot of fame. 4. The Narasimha Gayathri is, “Aum Nrusimhaya Vidhmahe Vajra Nakhaya Deemahi. Thannah Simha Prachodayath”. This is the mantra in which all the Vedas and Devas reside. The one who knows this would be the one with whom the Devas and Vedas will live forever. “Sudharshana (the holy wheel of Lord Vishnu) is that great Chakra. On its middle is written, the Taraka mantra (Aum) and also the single letter of Narasimha (Kshroum), on its six petals of the Sudarshana six letters (Sahasrara Hum Phat) are written, on its eight petals the eight letters (Aum Namo Narayanaya) are written, on its twelve petals is written the twelve holy letters (Aum Namo Vasudevaya), on its sixteen petals, the mathruka (model) sixteen letters with their roots (Am Aam, Em, EEm…. Aha) is written and on its 32 petals are written the letters of the “Narasimha Anushtup Mantra Raja.” This is the Sudarshana Chakra, This fulfills all ones wishes and is the gateway of salvation. It is a form of Yajur Veda, Rig Veda, Sama Veda, Brahmam and Amrutha (nectar). “All this is the letter “Aum”. What is past, what is present and what will be in future are its interpretations. All these are Aum. All these are Brahmam. This soul also is Brahmam. Joining this Atma (soul) with the Brahmam called Aum and joining together the Brahmam and the soul, and realizing that the birthless, deathless, nectar drenched and fearless Brahmam is nothing but the Aum, and then putting together the three types of bodies and all these in to it and then making it our own so as to become one with that and then destroy it. Continue to meditate that Aum which is the soul with the three types of bodies and also the Parabrahmam with three types of bodies. This soul which is gross and enjoys mega pleasures, which is also very minute and enjoys even the minutest pleasures and which becomes united and enjoys the pleasures of happiness, has four legs (branches). The four branches of Brahmam, which is Shining well, is full of same essence of happiness, is never aging, is never dying, is full of nectar and which is providing protection, should be matched with the four letters (branches) of Aum. The one who knows, that the Chaturathma Viswan (on the whole) and Vaiswanaran (partly) who are awake and have similarity to the four formed Aakara (letter Aa), are spread inside everything in the form of Sthoola (macro), Sookshma (micro), Bheeja (root) and Sakshi (witness) and are the first of everything, would realize all his wishes. He would be the first among every one. Because it is without syllable, it is peace (Shiva), it is the place where universe meets the end, it is indescribable, it has a non dualistic form and is placed in the fourth position, and it is “Aum” itself. The soul, who understands this in this manner, would attain the soul himself. Meditate deeply on Pranava (Aum) in the form of Chidagni (The fire within) which is in Agni Mandala (Orbit of fire) of the Mooladhara, in the Maha Peeta (consisting of 4, 7 and 32 petal lotus) with its family of four worlds (Earth, atmosphere, heavens and moon world) and seven souls (Loka-Veda-Devatha-Gana-Chanda-Agni-Vyahruthi). Then meditate on letter Aa which is the Chaturathma (4 souls) and the Sapthathma (seven souls) as Brahma in the belly (Mani Pooraka), on letter Uu as Vishnu in the heart (Aanahatha), on letter Ma as Rudra in the middle of eyelids (Aagna), on the dot which is the happy nectar form of the soul of Omkara (Sound of Aum) in Dwadasantha (just above the eyes) and the soul (Athma) in the form of sound in Shodasantha. Thus after worshipping with nectar (Ananda Amrutha) the four fold Brahmas (Devatha, Teacher, Mantra and the soul), Vishnu, Rudra separately and then together in the form of Linga with offerings and then unifying the linga forms in the Atma Jyothi (Light of the soul) and filling up the macro, micro and causal bodies with this light, we have to unify Atma Jyothi which is their basis with macro, micro, root and witness properties. Afterwards adjust the very gross Virat form in the very micro Hiranyagarbha form, and this micro form in the great causal Iswara form and after arranging the mantras similarly, and meditating on “Otha-Anuj-Jnathru-Anugna-Avikalpa” stages, and merging all this in to the Omkara (sound of Aum) in Thuriya, we have to reach the Nirvikalpa Paramathma (formless great truth). That type of practitioner would not have any desire towards worldly things, would have all his earlier desires fulfilled and would have desire only on Atma (soul). His Pranas (soul spirits) do not start and go any where and would attain their ultimate here itself in Brahmam. He exists as Brahmam and attains Brahmam. He who worships the exalted Atma in Omkara (the letter Aum), attains Brahmam in the form of Narasimham. Devas wanted to understand this Atma (soul). The Asura qualities caught hold of them. To get rid of that effect, they worshipped Narasimha who is the Thuriya soul which is in the summit of Omkara using the Anushtup Mantra. Then the sin like Asura qualities itself became the great light of wisdom which is the prime happiness (like poison becoming medicine). Those devas became mentally calm, having their sensory organs under control, became those who were not attracted by worldly desires, became those having patience, became those whose conduct became stable, became those who were attracted by the Atma, became those who were having playfulness, unity and happiness, and became those who realized that “Aum” is “light of Atma which is Para Brahmam”, and felt that all other places are empty and merged in to the “Aum”. So the practitioner should do penance like devas, stabilize his mind in the Omkara Para Brahmam, and would make other people see his Atma as Para Brahmam. There is a holy stanza about this viz. “After meditating on the horns which are the different parts of Pranava and further meditating on the Thuriya Paramatma which is a horn but not a part, add the Nrusimha Raja Mantra to the different parts of Pranava." The three types of Devas(Sathvika, Rajasa and Thamasa) serve the pranava in which, the first two letters (Aa and Uu) are merged and fixed in the third letter Ma and make themselves exalted. His soul is woven completely from side to side with thuriya. This with its Narasimha form, and in which every thing pervades and which is the soul of everything, contains everything. This is the secret and is without form or seed. This soul is non dualistic and without form or seed. The word “Aum” is non dualistic and is full of wisdom. (Narasimha, the soul of thuriya and the meaning of Omkara are all the same. They swallow everything). This is the unique body of Parameshwara (lord of every thing). This is without form or seed. This which does not have any form or seed, does not have differences within. The one who thinks that there is difference between them, breaks into hundred pieces and breaks in to thousand pieces and attains death from death. This is without a two, self resplendent and great joy. That soul is the ultimate support. It is Brahmam. Brahmam is the ultimate support. The one who knows this becomes Brahmam which is the ultimate support. Thus Prajapathi taught them. There is a stanza about it: “Understand that Atma which is spread everywhere by the practice of Aum. Understand that, the Atma which does not have any thing which is different and which is in you as the knower, is very much within you. After understanding that stabilize there, as a witness who advises".